After getting cold feet, and backing out, France has again struck a deal to share ownership of STX France with Fincantieri and let the Italian shipbuilding giant run the company. US State Department warns US citizens against travel to Cuba. The “treehouse” (and don't think some little crate a kid hammered together up in a tree - think “house” up in a tree) was built by “Treehouse Masters” host Pete Nelson at Mt. 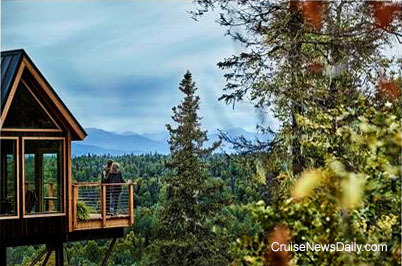 McKinley Princess Wilderness Lodge as the ultimate viewing platform to see the south face of Denali from the trees. An ongoing theme on Carnival's earnings calls is how the company keeps doing nontraditional things to expose people to cruising. One of those which we've told you about several times is producing television shows about cruising or what you can do in cruise ports. Taking that one step further, Carnival has now created OceanView, a streaming service where you can watch these plus two new direct to digital series, as well as other videos about cruising. Details appear in the September 28 edition of Cruise News Daily. During yesterday's earnings call to discuss Carnival's third quarter results, after mentioning the sale of three less-efficient ships during the year, CEO Arnold Donald said, “For that end, we have taken a write-off on assets currently deployed in Australia, which are less efficient with the intention of replacing those assets with more efficient vessels over time. ... P&O Australia generates revenue yields, both ticket and onboard, in line with our other brands in Australia, however, they have a higher operating cost in Australia and a disproportionate number of less-efficient assets." Later during the call he said, "The write-down was strictly related to less-efficient vessels in the plan to put more efficient vessels there all the time. Australia is a strong market, has been for us and will continue to be and we are looking forward over time, you know the ships will come out over time and we will replace them all the time with more efficient capacity." That was all that was said. It wasn't a major topic of discussion during the hour-and-fifteen-minute call, but later in the day, Carnival Australia released details of a series of ships that would either transfer brands or be reassigned to Australia by brands that sail there. The changes clearly demonstrate that Carnival sees the Australian market has become a major player in producing for the company. Details appeared in the September 27 edition of Cruise News Daily. Next fall, Azamara will expand their capacity by 50% through the acquisition of a third vessel of the same series (originally built for Renaissance) that has been operating as P&O's Adonia. Fincantieri said today they will lengthen Silversea's Silver Spirit early next year, the first time Silversea has lengthened one of their vessels. Royal Caribbean and MSC both made changes today based on Hurricane Maria's effect on the eastern Caribbean. 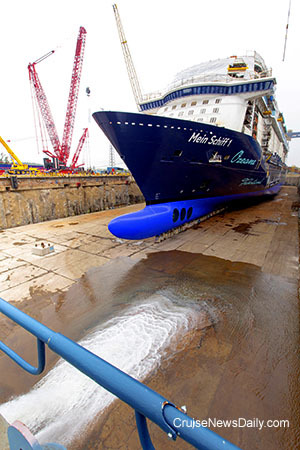 Details appeared in the September 26 edition of Cruise News Daily. Carnival Corp signed a memorandum of agreement with Fincantieri to build a new ship for the Cunard brand that is expected to be delivered in 2022. 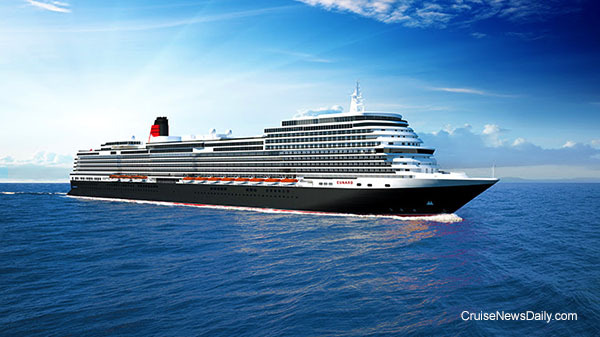 No name has yet been chosen for the new ship, but at 113,000 tons, it will be sized between Queen Mary 2 (still their largest at 149,215 tons) and Queen Elizabeth (90,901 tons). Crystal will be drastically downsizing capacity for Northwest Passage cruises.